There are 70,000 children of immigrants, most of them with little knowledge of Russian, attending school in Moscow. In Moscow’s Eastern District, many immigrants who work low-skilled, low-paid jobs send their children to School 1076, where Russian is taught as a foreign language. In the main hallway of Moscow School 1076, a trophy case shows off awards won by a team made up entirely of students from Afghanistan. 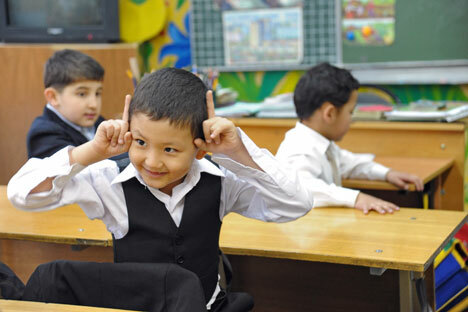 The school, located in the northeastern Moscow neighborhood of Golyanovo, will admit children of any foreigners who can produce medical and birth certificates, and the majority of the students come from Kyrgyzstan, Tajikistan, Afghanistan and Azerbaijan, although there are also students from Georgia and Ukraine. Many students take classes in Russian as a foreign language. A month ago, her students spoke no Russian at all. The children have 38 hours of Russian classes every week. “We’ve gotten used to pronouncing foreign names,” said the headmistress of School 1076. She as worked for several years in various African countries and feels very much at home among foreigners. The headmistress seems to regard educating children from the “near abroad” – the countries of the former Soviet Republics and Central Asia – as her mission in life and seems to pay more attention to them than to her Russian pupils. Internal tests show the same level of academic performance among Slavs and non-Slavs. Deputy Headmistress Yevgenia Girgoryeva shows off written work by both ethnic and non-ethnic Russians. “A people’s greatest treasure is the language it speaks,” wrote student Omar Alidzhan, without a single error. According to the Moscow Open Education Institute, there are more than 200 groups for children to learn Russian as a foreign language and 13 Russian language schools, including two evening schools, though other sources give different figures. The Immigration Service claims that Moscow has just 68 schools where Russian is taught as a foreign language. In late August, the city’s education department announced the opening of 245 schools that will offer Russian language training for preschool-age children of immigrants, but the department has failed to confirm whether any of these schools had actually been opened. In any case, a standardized program for teaching Russian to children of foreigners and special textbooks for them were approved in Moscow six years ago. Teachers of Russian as a foreign language are trained at the Open Education Institute’s UNESCO department, which also offers continuing education courses in this field. The school pins its hopes on just that kind of boy, but nobody knows if the effort invested in them will pay back. For some immigrants, Russia is just a staging post. Several families left for the United States after studying here for a year. An Afghan graduate went to join her Afghan boyfriend in Germany. But many do go on to enter colleges and universities. There is a consensus among teachers that the children of migrant workers are more active and motivated. “They are very upset when they get anything but the top marks. They have to establish themselves here,” said teacher Tatyana Nagiyeva. Among the students, there do indeed appear to be few problems related to ethnicity. First published in the Russky Reporter magazine.